Background: The rhizome of Oni-dokoro (a wild yam, Dioscorea tokoro) has extremely bitter taste and is not generally regarded edible; however, in northern part of Japan, such as Iwate and a part of Aomori, it is used as health promoting food. To clarify the reason, we examined the biologically active compounds in the rhizome collected at Iwate and compared them from the other area in literature. Methods: The acetonitrile extract from northern part of Japan was purified by bioassay-guided separation using antiproliferative activity to human leukemia HL-60 cell, and protodioscin (PD) was isolated and identified by instrumental analyses as the major active compound. 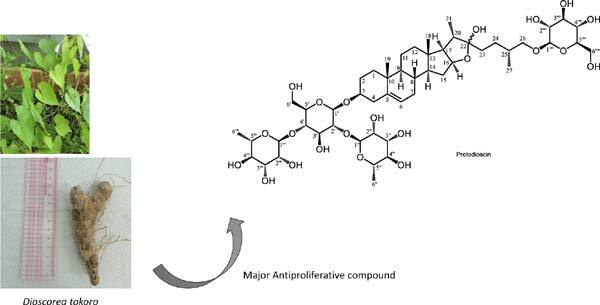 Results: PD known as a saponin with four sugar moieties, an inhibitor for platelet aggregation, and a low density lipoprotein (LPL) lowering agent, displayed strong growth inhibitory effect to HL-60. The literature search suggested that the rhizome from other area contained dioscin and other saponins with three sugar moieties as their major component. We assume that the edible and health promoting effect of the rhizome in the particular area is partially derived from these different components. Conclusion: We were interested in the differences of utilization in the rhizome of wild yam Dioscorea tokoro, and examined the chemical composition in the rhizome to find protodioscin as antiproliferative compound to HL-60. In the report from other area, the rhizome exhibited dioscin as the major compound. Our study indicated that the protodioscin/dioscin composition varied regionally, although the reason still needs to be investigated. Keywords: Protodioscin, dioscin, Dioscorea tokoro, HL-60, antiproliferation. Keywords:Protodioscin, dioscin, Dioscorea tokoro, HL-60, antiproliferation. Abstract:Background: The rhizome of Oni-dokoro (a wild yam, Dioscorea tokoro) has extremely bitter taste and is not generally regarded edible; however, in northern part of Japan, such as Iwate and a part of Aomori, it is used as health promoting food. To clarify the reason, we examined the biologically active compounds in the rhizome collected at Iwate and compared them from the other area in literature.